It appears that the adage 'everyone loves a freebie' isn't exactly true. Although U2 found it in their hearts to literally give away their latest album (their thirteenth) on iTunes, available to over 500 million iTunes customers, not everyone was chuffed. Many were put off by the fact that the album automatically turned up in their accounts, whether they liked it or not. So as not to upset the haters further, Apple soon released a removal tool just to delete the album. Now it's not necessarily an indictment of the band's decision to sign an extremely lucrative deal with the fruited one that has wound users up, but it probably didn't help any. It's just further proof that the selling of music moves in the most mysterious of ways, unlike ever before. Clearly this whole event has completely overshadowed the album itself, but what can you really expect from an album given away for free? It's a rabble-rousing start to proceedings and, let's face it, you wouldn't expect anything less from these aging Irish rockers. 'The Miracle (of Joey Ramone)' sees Larry Mullen Jr counting the track in with his sticks, with Bono opening up his lungs and chanting over the top before The Edge lets rip with his guitar in unmistakable fashion. It has the feel of a first single release from an album, which is just as well, as it is. It's certainly a pleasant wall of noise that doesn't let up. The band swiftly change gear, slowing the tempo right down for 'Every Breaking Wave'. With clichéd lyrics and written to a stadium rock template, the track has hints of the band in its prime, but nothing more. It will no doubt go down a storm on AOR stations in the States though. To give credit where it's due, it's produced with finesse from the hands of Danger Mouse, who produced the majority of the album. With an intro that's clearly an homage to the Beach Boys, it's difficult not to be cynical regarding ‘California (There is No End to Love)’; it’s screaming out to be used in promotional ads for the Golden state, as if getting a whole bank's worth of George Washingtons wasn't enough for the band. The TV ad will feature babes in bikinis frolicking on Venice Beach, with Bono's sunny vocals over the top. Another slowy in 'Song for Someone' that feels like it hits its stride with more confidence than the other tracks thus far. It's U2 ballad territory, and the song plants its flag comfortably in a fair wedge of its turf, resulting in a really strong effort. More wailing opens 'Iris (Hold me Close)' before Bono stamps his vocal authority all over it, swooping in and out like a singing gull, ably assisted by Mr Edge on guitar duties. Bono pleads to be held close, and you can't help but feel you probably would give him a little cuddle if he asked as nicely as this. Definitely a contender for a future single release. There's a hint of early Cure at the beginning of 'Volcano', with its dark and dank guitars, before Bono has some fun with the vocals on a bubbling bed of this and that. That playfulness continues with the quietly curious 'Raised by Wolves'. Flashes of guitar give an indication to a chorus that Tarzan would have been proud of. It would have been nice to have seen Bono's name on the track listing include an 'i' just for the fun of it. But what the song actually means is a mystery and it leaves you wondering what it would actually be like to be raised by wolves. Sadly, Bonio isn't telling. A gentle melody accompanies 'Cedarwood Road' throughout, but it struggles to make any kind of an impact. It pops its head up and waves its arms around a bit, before disappearing again. Remember eighties electro? U2 obviously do. 'Sleep Like a Baby Tonight' begins like a classic eighties track, before mutating into something a little different and sadly less appealing. It's part dreamy, part drippy. Gotta love that keyboard action though. The end is near, as the album just starts to flag a little with 'This is Where You Can Reach Me Now'. It's a b-side stuck on the end, just to make up the numbers. And then we really do reach the end with 'The Troubles'; it's made slightly more remarkable than it possibly has the right to be with the inclusion of backing vocals from Swedish singer Lykke Li. Her vocals certainly compliment Bono's and gives this slower track pleasing depth and sharper dimension. 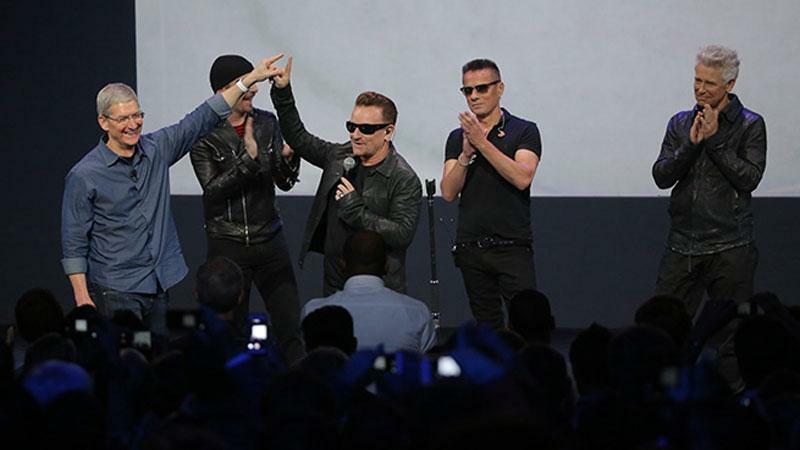 Bono cheers the one man that did buy U2's album, the boss of Apple. You'd have thought someone would have told him that he could have downloaded it for free. 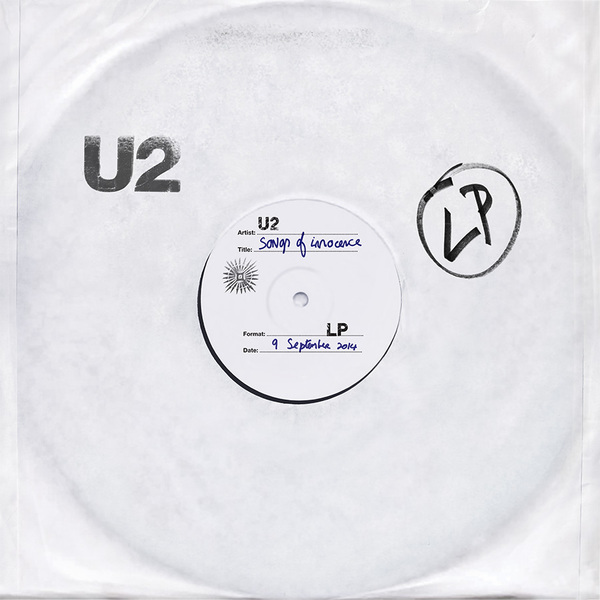 Considering that if you ask the average punter in the street what the title of U2's last album was (2009's No Line on the Horizon - we confess we didn't remember it either), giving this away for free on iTunes is a pretty smart move. But in doing so, you also run the risk of people only remembering it for just that – the album U2 gave away. This is not a great album. It cannot possibly be considered one of their best – after all, their classic stuff is just that, and there's no way that anything they produce now will ever compare – but it's an inoffensive listen that has certain merits. There are enough tracks here that, if nothing else, are a good reminder of the kind of band they were in their day. There are also one or two others that some could say are a good indicator that they've had their day. The way it was released certainly holds intriguing repercussions however, as no doubt other big corporations will see this as an opportunity to buy their way into the music industry. And if U2 were happy to sell their musical souls to the devil, you know others will do the same. The question is however, would you buy it if it wasn't for free? Our answer to that is a telling no.